AHAN has setup “Handicraft Pavilion” at 10th Expo Pakistan from 9th to 12th November 2017. Expo Pakistan is biggest trade fair in country organized by TDAP. 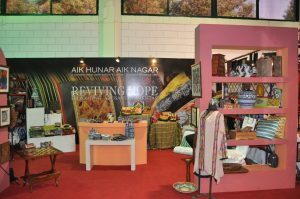 Aik Hunar Aik Nagar has set up a pavilion of 18 stalls gathering vivacious crafts from every province along with 30 artisans and craftsmen, majority of them were women. Embroidery, Carpets and Rugs, Wooden Handicraft, Organic Honey, Shawls, Hand-woven fabric, Ajrak and Khes were displayed at AHAN Pavilion. Artisans got great response from foreign buyers and secured production orders of worth .369 million USD. AHAN has also signed an MoU with Shaanxi Hancheng Industrial Investment Co.,Ltd. Which is a state owned company based on ‘One Belt One Road’ promotion, for cooperation in handicrafts sector and trade between two countries. State Cement Corporation Building, Near Lahore Race Club, Kot Lakhpat, Lahore. Copyright © 2015 AHAN - Aik Hunar Aik Nagar.Designed by: ITlinks.